It’s that time of the month where I get to partner with a few lovely bloggers and bring you a fun themed blog hop! 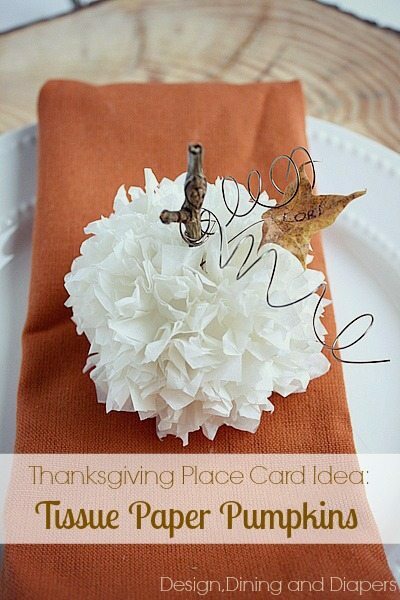 Over here I’m sharing a Thanksgiving Place Card Idea and if you keep scrolling down you’ll see 10 other Thanksgiving Table Setting Ideas! 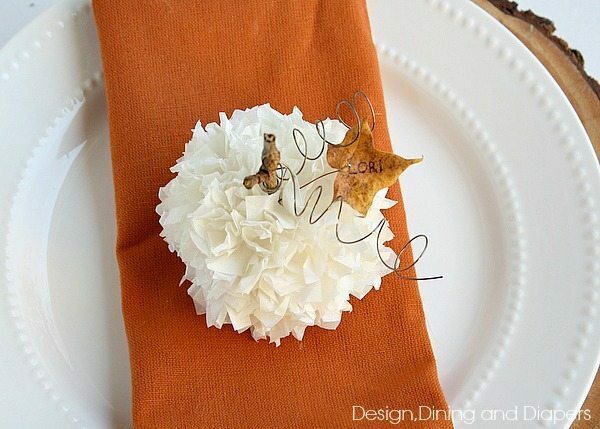 These little Tissue Paper Pumpkins are super easy to make and the added natural elements give them a rustic touch (and inexpensive I might add). 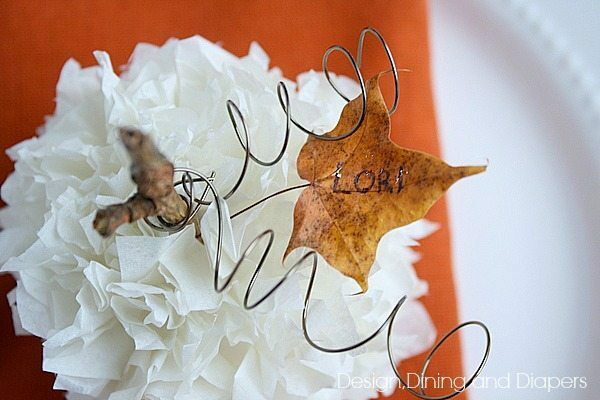 You can just leave the pumpkins plain for table décor, or add someone’s name to the leaf and turn them into a place card. 1. Cut the tissue paper into squares. 2. Start by placing the twig (stem) into the Styrofoam. 3. Wrap the tissue paper around the end of a pencil, put a drop of hot glue on the end and then secure it to the Styrofoam ball. Continue until the ball is covered. 4. Using some thin wire, wrap it around your finger (or a pen) to create a spiral and then wrap it around the stem. 5. And lastly, place the leaf in place. So cute, Taryn! What a great idea! Oh my goodness Taryn- I love this!!! So cute… I am pinning!!! These tissue paper pumpkins are so cute! I’m pinning! 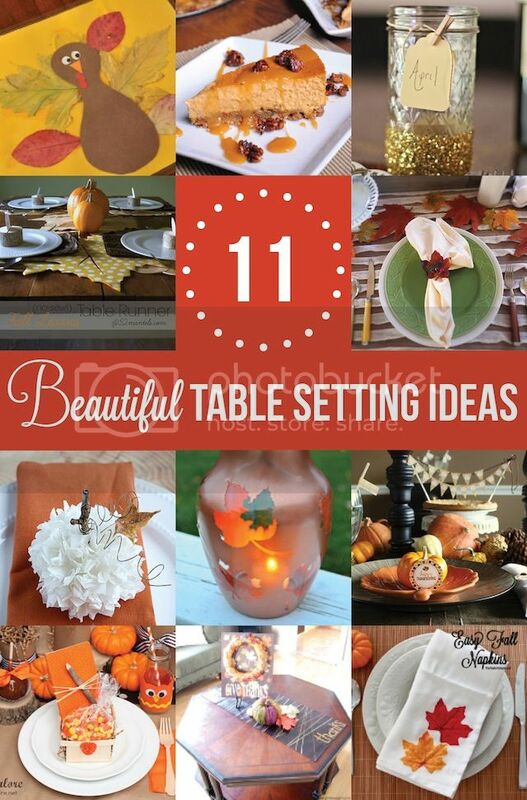 Your little pumpkin is so sweet, and what a fun idea. The kids could help make these. Pretty round up, too. Sharing! These are so cute Taryn!! Thanks for sharing! so cute Taryn! I have been crazy for anything pumpkin this season, and yours are adorable! This is so beautiful, yet so simple! Love it!